Let’s suppose you’re having difficulty bending your horse to the left. First, you want to make sure that you’re not leaning inward with your upper body as you try to push the horse outward with your inside leg, for your weight will counteract the effort of your leg. You may be breaking inward at the rib cage or the entire axis of your upper body may be tilted toward the left, so that your upper body weight is cast this direction, drawing the axis of the horse’s body this direction as well. If the horse is leaning to the left, it will be virtually impossible for it to move to the right, away from your inside leg aid. 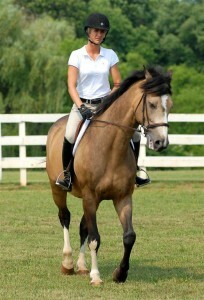 First, then, make sure you are sitting squarely on your horse, rather than leaning to the left. Secondly, you have to give the right side of the horse’s body a place to go when you ask the animal to move away from your left leg. This includes moving your outside hand forward and out a few inches, so that the animal can bend slightly at the neck and displace its right shoulder to the correct degree of bending. Your right leg must be in “behind the girth” position, about four inches farther back than normal, so that the horse’s ribcage can be displaced to the right, onto the correct degree of bending. Your inside seat bone should be slightly ahead of your outside seat bone, so that your hips match the bend of the horse; and your weight should be equally distributed on both seat bones. If you have made all of these corrections and are still having problems, you can exaggerate the principles involved in bending by opening your outside rein about six inches to a foot so that the horse receives a leading rein effect through the turn. You can also shift some of your weight to your outside seat bone to reinforce your inside leg aid and to help shift the horse’s weight toward the outside. You can even move your upper body slightly off center to the right, so that it encourages the horse’s vertical plane to shift toward the right a little. Once the horse recognizes where you want it to go through the bend, then you can resume the normal, less exaggerated aids: an inside indirect rein, the inside leg in at-the-girth position, and the outside leg in behind-the-girth position. The main thing to remember is to give the horse a place to go. Whenever you increase an aid, you have to make it easy for the horse to go the proper direction. For example, if you squeeze with your legs, then you must release some hand pressure in order to give the horse a place to go; and if you push with your left leg and bend the horse to the left with an indirect rein through the turn, then you must ease off of your right rein a little and make sure your right leg has relaxed enough and is in a “behind the girth” position so that the horse can shift its ribcage to the right. Always provide an “open door” that is clear to the horse, so that you don’t frustrate the animal and yourself through the inadvertent clashing of aids. The horse is resistant as the rider tries to bend it to the left. 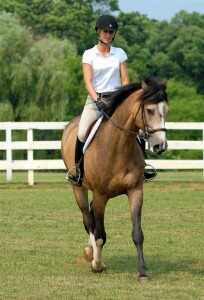 With her hands positioned in a left indirect rein, the rider opens her outside (right) hand to encourage the horse to displace its weight to the outside of the bend. The horse transfers its weight and relaxes into a left bend. 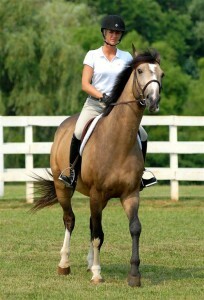 The rider moves her right hand back into the proper position so that the horse won’t be encouraged to drift too far to the outside of the bend.